Parched Movie Review: The Girls Can Have all the Fun ! Just last week we had a movie about what 3 women go through after a fateful night. The women stayed in the capital city & were independent, educated and stood up to men. A week later, we have Leena Yadav’s Parched. A film that is set in rural Rajasthan, and is about 3 women who are uneducated, stubbed by men & society and are liberated only by their imagination. The movie reaches the theatres after winning multiple accolades world over and fighting it out with the censor board. You will understand both the accolades & the battle bit when you watch the film. 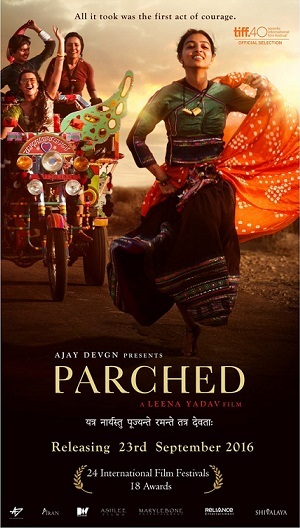 PARCHED is a movie about 3 women – Rani (Tannisththa), Lajo (Radhika), Bijli (Surveen) – who live in a village of Rajasthan. The setting as such gives you a feel on “been there seen that”. All the three women are victims of patriarchal culture. The setting is, though exotic at times, fantastic mostly. The feel of the hinterland is real and authentic. Rani is a young widow, whose goal is to get her son married, Lajjo is a wife trapped in a violent marriage and suffers the ignominy of being barren and Bijli is a dancer & a prostitute. Parched is a story of these 3 women who are friends. They are a little different from other women of the village in the sense that they are shown to be liberated by their thoughts & dreams. While majority of the women in the film believe that they are not supposed to study, be silent towards the atrocities of men, be child bearing machines & behave like docile, good wives, these 3 at least want to break free of that mould. The men on the other hand go about thrashing their wives, and drink all day and basically treat all women as objects that can bear them a child. A particular scene is gut wrenching where a kid (Rani’s son), under the influence of alcohol, yells at her mother – “ Ja raha hu ghar chod ke, dekhta hu kaise chalega ye ghar bina mard ke”. As for the performances, Radhika Apte is fantastic, minus her varying dialect. As they say, acting is as much about reacting as is it about emoting, Radhika’s performance is top notch. Tannisththa (she is also one of the producers) gets a meaty chunk of a role that she plays with enough elan. Surveen also does a decent job of adding the oomph factor. She is the most outspoken and forward thinking of the trio. Special mention to Mukesh Chhabra who yet again nails the casting. Every single character gets the act right. Be it Rani’s kid or Bijli’s pimp.Adil Hussain makes a 43 sec appearance in the film and is aptly titled in the credits as “Mystic lover”. The film has a lot to like. A clutch of scenes that hold you by the scruff of your neck. I loved a particular scene where Rani & Bijli almost kiss each other. Both of them are broken, absolutely shattered, but find solace (albeit for just a fleeting moment) in each other’s arms. Another scene that made me smile was one involving the 3 women with a mobile phone in a secluded spot. While, there is enough material to like the film, it is not without it’s fair share of missteps. For instance, the lingo. The dialogues are written Hindi (for mainstream audiences) , just ending with “Karu se” and the like. It gets a wee bit jarring after a while. Then there is the abuse, both verbal & physical. Yes, I agree that everything feels realistic and it comes out well. Just that there is too much of it. The verbal abuses are hurled at everyone liberally. Multiple scenes involving physical abuse makes you squirm and uncomfortable. There is just too much of it throughout the film. Lastly, though exotic, the film cannot escape it’s zone of being “arty”. It does not take a while to get to the point. It takes too much time establishing it. If last week’s Pink got you debating about the safety and the general attitude of and against women of our country at large, Parched will definitely make you think and debate further. If not for the sake of debating, just watch it for the fact that there is no knight in shining armour waiting to save the day here. The women can save themselves, liberate themselves. Not always do you need an Amitabh to save the day. The girls can have all the fun! Court: Does it do enough justice to the expectations? Mad Max: Fury Road Movie Review: Keep Your Helmets On! ← Do Indian Films need an Oscar?